El shoegaze es ese género que, vivieses sus inicios o no, tiñe todas las escuchas de un sentimiento de nostalgia por lo no vivido, sacando el lado más introvertido de cada uno de nosotros. Pero Fever Dream no se queda en esta etiqueta. Su música sale hacia afuera, haciendo bailar y headbangear con sus increíbles guitarras distorsionadas. Han tenido que pasar dos años desde que lanzasen su debut “Moyamoya” (Club AC30, 2015) para poder disfrutar de su último álbum llamado “Squid”, lanzado el último año por Club AC30 (sello de Pinkshinyultrablast, Flyying Colours, Ringo Deathstarr). 10 temas que demuestran que Cat, Sarah y Adrian tenían ganas, muchas ganas, de demostrar que lo suyo es el ruido con ese desorden ordenado que todos ponemos como excusa para nuestras habitaciones y mesas de oficina. Un álbum algo punk que se devora como se devoran las noches que nunca quieres que acaben. 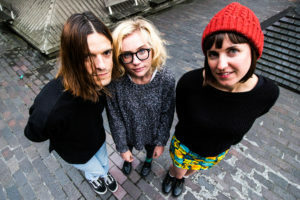 Tanto si eras de los que se colaban en la habitación de tu hermana mayor a escuchar Sonic Youth, Smashing Pumpkins, Pavement o My Bloody Valentine como si la hermana eras tú misma, tienes tu hueco en Madrid Popfest 2018. Shoegaze is that kind of music genre which, whether you lived at its beginning or not, covers every listen with a feeling of nostalgia for things you haven’t lived, bringing the most introvert side of each one of us. But Fever Dream don’t stop in that tag. Their music comes out, making you dance and headbang with their incredible distorted guitar noise. It has been two years since they released their debut album “Moyamoya” (Club AC30, 2015) for us to enjoy their latest album called “Squid”, released last year by AC30 ( Pinkshinyultrablast, Flyying Colours, Ringo Deathstarr). 10 songs that reflect how Cat, Sarah and Adrian were looking forward to demonstrate that their trademark is ordered messy noise we all use as an excuse for our bedrooms and office desks. An album with a touch of punk that everyone will devour like the nights you want to last forever. Regardless if you were one of those who sneaked into her big sister’s bedroom to listen to Sonic Youth, Smashing Pumpkins, Pavement or My Bloody Valentine, or if was yourself the sister, you have your place at Madrid Popfest 2018.